We're invited by Berlin Fencing Club for a friendly visit on 23-25 April 2010. 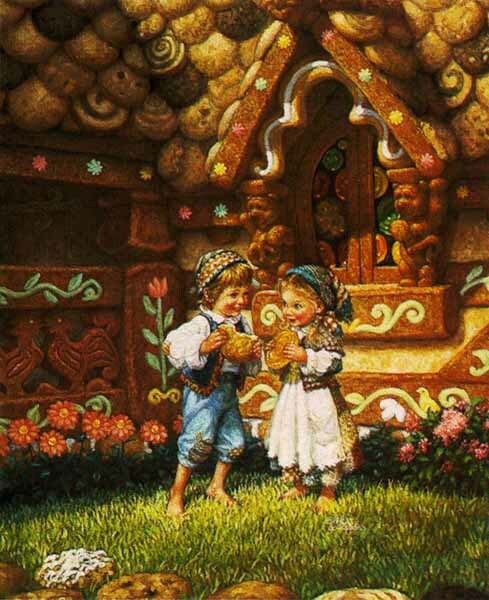 We will take part in the traditional Hansel and Gretel tournament (team tournament with teams of 2, one male - one female, one foil - one epee in any combination). There also will be a sabre tournament and a joint training session with the Berliner comrades. Other details such as the price and the accommodation are still being finalized. However if you think you might be interested in this trip please make a note in your diary and start brushing up on your German! The beginning of the year was busy with tournaments with Cambridge, Essex and Slough Open being the most relevant to our fencers. We were well represented in epee and marginally in foil (by Etienne). Well done to everyone who took part and specially to Gianluca (the winner of Slough), Adam, Adeel, Lorenzo and Ondine who produced excellent results. Anyone who is interested to have a go in one of the forthcoming competitions is encouraged to check the competitions calendar and then talk to fellow members with a view of going together. 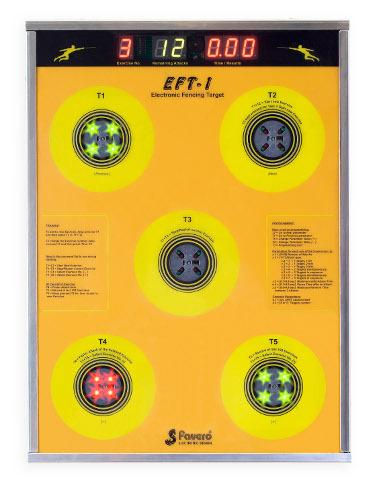 Electronic target aimed to test and improve precision and reaction times will soon be available for your attacks at Finsbury Leisure centre. The target developed by Italian maker Favero can be programmed to different types of attack, will measure the reaction times or set the time limit to which the attack should be performed. Type 1. One target, one hit. Type 2. One target, two hits in rapid succession on the same target. Type 3. One target, three hits in rapid succession on the same target. Type 4. Two targets at the same time, to be hit as desired. Type 5. Two targets one after the other, to be hit in sequence. Type 6. Three targets at the same time, to be hit as desired. While we're waiting for this fascinating piece of equipment to arrive it's worth remembering that similar exercises can be performed on a normal lunging pad or in fact on any improvised target which you can easily set up at home or in an office. It is recommended to spend a few minutes practicing on the target every time before you get on the piste. Oxana will be available to individual lessons on Saturdays (as well as the usual Mondays) starting from the next week. 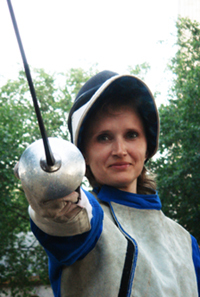 As a former national team coach of Uzbekistan Oxana teaches foil at all levels as well as the basics of the other two weapons. Highly recommended! The lessons are available from 2 pm to 5 pm and can be booked here. Just joined the club? Here are some answers to the typical FAQs from newcomers. Do I need private lessons? Private lessons can be extremely beneficial to your progress as a fencer. Whether you compete or not, this is your chance to develop your individual tactics, perfect some 'golden strokes' and correct bad habits! Try to book at least 20-40 min of private lessons a month if you use fencing for recreation and more if you compete. You can book the lessons via the website: http://www.londonfencingclub.co.uk/private_lessons.php on a pay-as-you-go basis. The members' rate for individual lessons is currently £48 p/h (they can be 20, 40 or 60 min). There are cheaper rates if you set up a pre-paid lessons account. We also offer the dedicated Individual Lessons plan. The deal is simple: add £36 per month to your subscription and receive a monthly 1 hour individual tuition allowance (this makes it 33% cheaper than the usual members' rate). If on any particular month you cannot use the whole allowance, it is rolled over to the next month! We recommend attending the fencing sessions at least 2-3 times a week - this way your skills will build up much faster and you won't feel that after a week of inactivity you've forgotten what you learn at the previous lesson! Two evening classes + Saturdays free play is probably the best combination which will give you a good balance of learning and practice. This plan is only £55 per month (£35 + £10 + £10) and we'll also give you a free complimentary private lesson every month! If you've already signed up for that plan, please set up a lessons account where your monthly allowance will be credited automatically. Should I get my own kit? Having your own fencing kit is more comfortable, safe and hygienic than using the beginners range you use at the club so with it you'll enjoy fencing more. You will also fence better as good gear allows you to speed up movement while also helping not to over heat! Members of our club are normally entitled to 10% discount from advertised prices on leading brands e.g. at PBT, Duellist or Leon Paul. 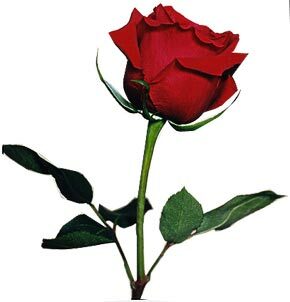 And finally I wish the most romantic Valentine Day to everyone! I hope Love binds your blade. Or touches your jacket or something. We're running a short Valentine taster class this Sunday. It's too basic for any of you but if you have non-fencing friends who might prefer crossing blades to holding hands, please feel free to direct them to the page where they can book their place. A very few last places are still available.